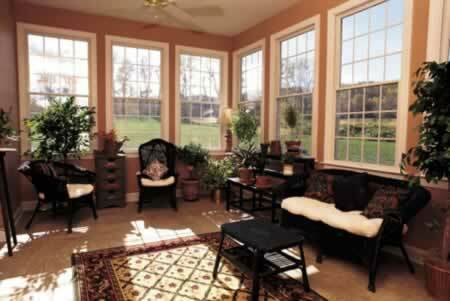 Make the most out of your sunroom by understanding the best kind of windows for your viewing pleasure and comfort. Keep in mind that a sunroom is meant to let in the natural light, so your windows will probably be both wide and tall. In some sunrooms, the windows cover an entire wall or two, flooding the space with the sun's glow. But how can you have a great sunroom and still keep your utility bills down? Opt for thermal windows that provide the maximum in energy-efficiency. Triple-paned windows provide two layers of protection against the elements. Argon, usually used in the spaces between the windows, is an inert gas with a conductivity of about 1/3 less than that of regular air. Low-emission glass is also recommended for those areas where heat can be intense. And finally, look for windows that are tempered, or "shatter proof." This safety element is usually a requirement for sunroom windows.